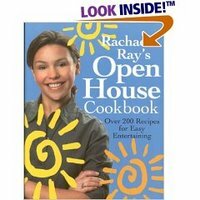 Everything Rachael Ray: New Open House Cookbook? Too Good to Be True? New Open House Cookbook? Too Good to Be True? I have coveted the old school Rachael Ray Open House Cookbook for a long time, not really because of its contents, but because of its sentimental value. The thing is so darn old that it serves as a landmark in Rachael Ray's career. The original Open House Cookbook was published in February 2000 and costs around 100 bucks, used. They even tease me on Amazon with the Look Inside feature. Darn them! According to Amazon, the New Open House Cookbook is set to release on October 25, 2006. Just in time for the holiday season - good thinkin' Rach! But the new Open House Cookbook will release only a mere couple weeks before 2, 4, 6, 8. That makes me skeptical. Maybe once I see the cover I will believe it. Now, if only I knew how this one is different from Get Togethers, I would be set.... Guess we will have to wait for more details.